In a Stirling radioisotope system, heat must continually be removed from the General Purpose Heat Source (GPHS) modules to maintain the modules and surrounding insulation at acceptable temperatures. The Stirling converter normally provides this cooling. An alkali-metal Variable Conductance Heat Pipe (VCHP) has been developed to provide back-up cooling, allowing multiple stops and restarts of the Stirling convertor. Unlike standard VCHPs which maintain a relatively constant temperature, this VCHP has two different heat rejection surfaces. During normal operation, heat is transferred to the Stirling convertor heater head. When the Stirling convertor is stopped, the VCHP temperature increases by 30°C, and the gas front is pushed back, allowing the heat from the GPHS to be rejected to the Cold Side Adapter Flange (CSAF) using a low-mass, carbon-carbon radiator. The 880°C temperature when the Stirling convertor is stopped is high enough to avoid risking standard ASRG operation, but low enough to save most of the heater head life. The Haynes 230/sodium VCHP was successfully tested with a turn-on ΔT of 30°C in three orientations: horizontal, gravity-aided, and against gravity. Any unexpected stoppage of the convertor during operation on the ground or during a mission. In the current system design, the insulation spoils (partially melts) if the convertor stops, to protect the GPHS from overheating. A VCHP was developed to allow convertor operation to be restarted on a planned convertor stoppage and potentially allow for convertor restart on any unexpected stoppage, depending on the reason for the stoppage. It would also save replacing the insulation after such an event during ground testing. In a normal VCHP, the Non-Condensable Gas (NCG) front blankets a portion of the condenser surface. As the temperature increases slightly, the increased vapor pressure compresses the NCG, exposing more of the condenser surface. The NCG reservoir is sized to maintain the evaporator temperature near a nominal temperature as the power is increased or decreased. In contrast, the current VCHP has two different heat rejection surfaces. One surface supplies heat to the Stirling convertor during normal operation, while the other is used to dump the heat from the GPHS when the Stirling convertor is off. The schematics in Fig. 1 show the basic concept of the VCHP integrated with a Stirling convertor. A GPHS module supplies heat to the heat collector which, in turn, wraps around the hot end of the Stirling convertor’s heater head, so the normal heat flow path is GPHS – heat collector – heater head. The annular evaporator of the VCHP wraps around the heat collector so, during normal operation, vapor is approximately at the heater head’s temperature. The non-condensable gas (NCG) charge in the system is sized so the radiator is blocked during normal operation (see Fig. 1(a)). When the Stirling engine is stopped, the temperature of the entire system starts to increase. Since the system is saturated, the working fluid vapor pressure increases as the temperature increases. This compresses the NCG. As shown in Fig. 1b, this opens up the radiator. Once the radiator is fully open, all of the heat is dumped to the radiator, and the temperature stabilizes. Once the Stirling engine starts operating again, the vapor temperature and pressure start to drop. The noncondensable gas blankets the radiator, and the system returns back to the normal state (Fig. 1(a)). The Advanced Stirling Radioisotope Generator (ASRG) (Chan, Wood, and Schreiber, 2007) was selected as the baseline Stirling system design. The system consists of two Advanced Stirling Convertors (ASCs), mounted back to back to minimize vibration. Heat to each ASC is supplied by one GPHS module. A cold-side adapter flange, shown in Fig. 1 is used to conduct the waste heat from the Stirling engine cold side to the ASRG housing. This is fabricated from copper, and serves as a structural member. As shown in Fig. 1, when the Stirling convertor is turned off, then the radiator dumps all of the heat from the GPHS to the Cold Side Adapter Flange (CSAF). A summary of the design requirements is presented in Table 1. The heater head hot-end temperature was 850°C for this program, compared to the current ASRG engineering unit temperature of 650°C. 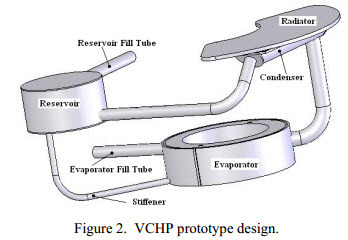 A schematic of the VCHP prototype is shown in Figures 2 and 3. Heat passes through the heat collector and into the annular heat pipe evaporator, which in the real system would surround the Stirling convertor heater head. During normal operation, the NCG blocks the remainder of the VCHP. Heat is transferred from the bottom of the evaporator to the inner wall, where it provides energy to the Stirling convertor. A tube runs from the annular evaporator to a secondary condenser and radiator. A second tube then runs from the condenser to the NCG reservoir. When the Stirling engine stops, heat is no longer removed from the inner evaporator. The temperature and pressure inside the VCHP increase, driving the NCG front past the condenser and radiator. Heat is removed by radiation to the CSAF, until Stirling engine is started up again. As the temperature drops, the NCG front moves close to the evaporator again, cutting off the secondary radiator. 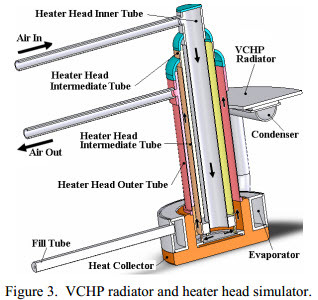 A cut-away of the VCHP with the heater head simulator is shown in Fig. 3. In a Stirling convertor, heat is removed by the unsteady flow of gas through the heater head. 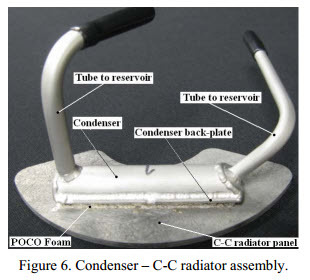 For these experiments, the heater head is simulated by an annular tube assembly where compressed air enters through the inner tube and exits through the annular space, removing the heat by convection from the heat collector – heater head interface region. The air flow rate is monitored by a Pitot tube, while inlet and outlet temperatures are monitored by intrusive thermocouples. The reservoir is located under the CSAF, in the insulation surrounding the Stirling convertor. The initial concept was to locate the reservoir so that its temperature would be relatively stable when the convertor was turned on and off. After numerous CFD iterations to determine a reservoir location with a small ΔT, it was determined that the minimum change would be 300-400 K. Since this change in temperature is unacceptable (the reservoir size would increase unrealistically), the system design was modified to cool the reservoir by radiation to the CSAF. Temperature difference (ΔT) necessary to turn the VCHP ON. Figure 4 shows the required reservoir volume as a function of these two parameters for a certain fixed geometry and reservoir cold temperature (in this case the cold reservoir temperature is the origin, 450 K). It is clearly shown that for each selected ΔT, the reservoir size increases very abruptly beyond a certain hot reservoir temperature. For example, with a 30°C ΔT, the reservoir volume exceeds reasonable values (20-40 cm3) very abruptly when the hot reservoir temperature is ~570 K.
If we chose 17 cm3 as the upper limit of a reasonable reservoir volume, then, for a 30 K turn-on ΔT, the maximum hot reservoir temperature we can have is 571K. 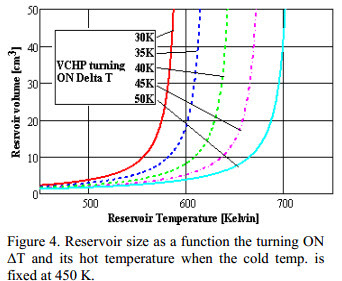 The only possibility that allows a good design for higher hot reservoir temperature values is to increase the VCHP turn-on ΔT, with possible significant impact on heater head life. As an example, for the same 17 cm3 reservoir volume but with a 50 K VCHP turning-ON ΔT, the hot reservoir temperature will be 681 K. Higher ΔTs are undesirable, since it may require lowering the nominal operating temperature to avoid creep problems over the life of the system. Vcg + Vcdg is the VCHP volume between the evaporator and the end of the condenser. A significant geometry change (9 times higher volume ratio) has a small impact on the allowable hot reservoir temperature, increasing it by only 12 K.
Cold reservoir temperature should be at least 450 K (the objective is to increase it). A reasonable reservoir size would be around 17 cm3 (the objective is to keep it low). VCHP turning-ON temperature difference should be around the original 30K (the objective is to keep it low). Hot reservoir temperature should be around 570-680K (the objective is to decrease it). Since the geometry (volume ratio) impact on the above parameters is weak, it is convenient to keep the current pipe length and choose the closest standard and off-the-shelf tube diameters available for Haynes 230. Finding the proper location of the reservoir and solutions to keep the hot reservoir temperature in the above range became mandatory. 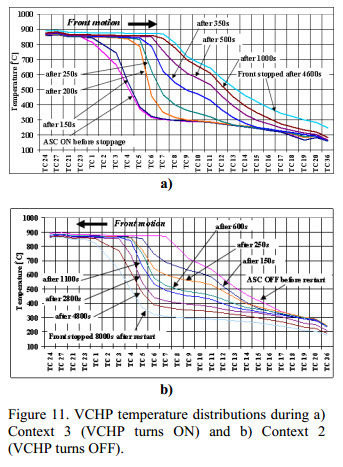 The solution of the reservoir temperature problem was solved by creating artificial heat leaks from the reservoir to CSAF by radiation through an aperture in the insulation. These heat leaks are in the order of 1W. 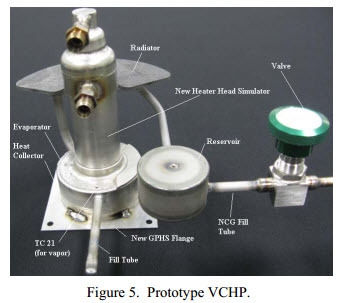 The prototype VCHP is shown in Fig. 5. The VCHP fabrication material is Haynes 230 because of both its compatibility with sodium based on long duration life tests by NASA Glenn (Rosenfeld et al. 2004) and its low creep rate at 850°C. At the bottom of the annular evaporator is the heat collector that receives heat from the GHPS simulator. The heater head simulator, which removes the heat during normal operation (ASC “ON”) is brazed to the upper/inner side of the evaporator. The carbon-carbon radiator is shown behind the heater head simulator. It is shaped to fit around the Stirling convertor (or simulator). Details of the radiator design and fabrication can be found in Tarau et al. (2010). The testing setup is designed to simulate the VCHP behavior with a simulated ASRG and GPHS; see Figure 7. Two of the four copper walls were removed in this picture. Prior to testing, the empty space inside the copper box was filled with MicroTherm insulation. Four adjustable legs are attached to the setup to allow testing in different orientations inside the vacuum chamber. Figure 8 shows the locations of the thermocouples used to measure the temperature distribution along the VCHP. Thermocouples from 1 to 20 were spot welded to the pipe. The remainder were inserted into thermo-wells. Thermocouple 36 measures the NCG temperature in the reservoir while thermocouples 21 and 23 (not shown in Fig. 8) measure the vapor temperature in the evaporator. 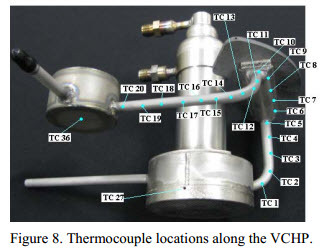 Thermocouples 24 and 27 (24 is not shown in the figure) measure the heat collector wall temperature under the vapor space. These thermocouples can be seen in Figures 9 through 11 as components of the entire VCHP temperature profile. The average distance between the thermocouple locations along the VCHP is approximately 12 mm. The VCHP was charged with 17 cm3 of sodium and 4.98 x 10-4 moles of NCG for the baseline vapor temperature of 850°C. Context 1: Heat Losses: The system is supplied with the minimum electrical power required to maintain a vapor temperature of 850°C under steady state conditions. No cooling is applied during this context and the applied power compensates for all of the heat losses. 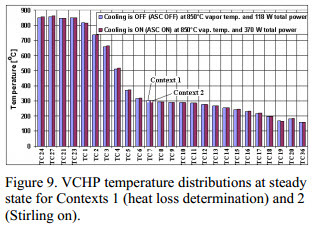 Context 2: ASC “ON”, VCHP “OFF”: The heat supplied to the system consists of two components: losses and heat supplied to the ASC (nominally 225 W). In Context 2, cooling is applied to maintain a vapor temperature of 850°C, with the front at the exit of the evaporator (between TC23 and TC1). This context simulates normal operation of the ASRG, before the ASC stoppage and when the VCHP is OFF. Context 3: ASC “OFF”, VCHP “ON”: The system is continuously supplied with the same total power as in Context 2, however no cooling is applied. This context simulates the system after the ASC is stopped and the VCHP has turned ON, rejecting the heat through the radiator to the CSAF under steady state conditions. The steady state conditions (reached at the end of each context) will be discussed next, while the transient responses (front motion) will be discussed in the second part of this section. 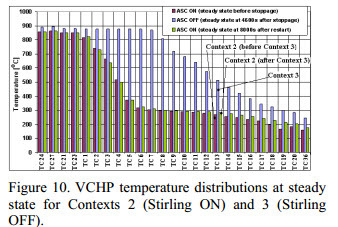 Figure 9 shows the temperature distributions along the VCHP at the ends of the first two contexts. It can be observed from Context 2 that, when cooling is ON (ASC ON), all the temperatures along the VCHP are reasonably close (except the heat collector – TCs 24 and 27) to those corresponding to Context 1 (cooling OFF). This verifies our assumption that the heat losses during Context 1 are equal to those during Context 2. In both contexts, the front is located at the exit of the evaporator at a vapor temperature of 850°C and reservoir temperature of ~160°C. The reservoir temperature as lowered from the ~250°C in Tarau et al. (2010) by redesigning the VCHP to decrease the heat leaks through the VCHP. Of particular importance was using a thinner tube with few screen wraps to decrease the heat leak through the tube connecting the condenser and the reservoir, and increasing the aperture to radiate heat from the reservoir to the CSAF. 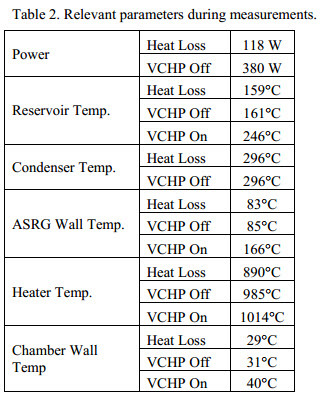 The heat losses during Context 1 are 118 W, while total power (electrical) during Contexts 2 and 3 is 380 W, resulting in a VCHP throughput of approximately 262 W.
The transient VCHP temperature profiles for Contexts 3 (Cooling Gas off, VCHP activated) and 2 (Cooling Gas on, VCHP deactivated) are presented in Figure Figure 111. Figure 11a starts with the lowest temperature profile, where the cooling air is active (ASC ON). The evaporator is at 850°C, and most of the heat is going from the heater, through the annular evaporator, and into the cooling air. The radiator is OFF, with temperatures below 300°C. Once cooling is stopped (ASC OFF), the system starts to heat up, and the NCG gas front moves toward the condenser. As it travels up the condenser, heat is transferred to the wall of the ASRG simulator and then to the ambient (vacuum chamber walls) by radiation. When cooling is turned on the system gradually cools. The vapor temperature and pressure drop, and the NCG front moves back towards the annular evaporator. As expected, the gas front moves at a faster rate in the beginning and slower toward the end of each of the two sequences, as steady state conditions are approached. It can be observed that the front is slower during the return when the radiator is activated. A sodium VCHP has been developed to provide back-up cooling, allowing multiple stops and restarts of the Stirling convertor. Unlike standard VCHPs which maintain a relatively constant temperature, this VCHP has two different heat rejection surfaces. During normal operation, heat is transferred to one condenser. With no heat removal from the first condenser, the VCHP temperature increases by 30°C, and the gas front is pushed back, allowing the heat to be rejected to a second condenser. 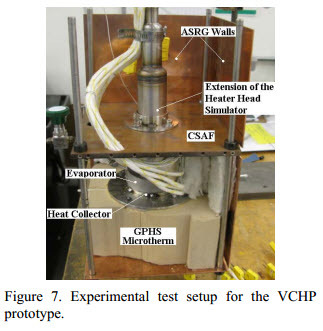 While the presented prototype was only tested in the gravityaided orientation, tests with previous prototypes show that the VCHP can operate in any orientation. This research was sponsored by NASA Glenn Research Center under Contract No. NNC07QA40P. Any opinions, findings, and conclusions or recommendations expressed in this article are those of the authors and do not necessarily reflect the views of the National Aeronautics and Space Administration. Lanny Thieme is the contract technical monitor. We would like to thank John Hartenstine of Advanced Cooling Technologies, Inc., Jeff Schreiber and Jim Sanzi of NASA Glenn Research Center, Bill Miller, Rogelio Ramirez, and Wei Shih of Allcomp, Inc., and Jaime Reyes, Jack Chan, and Michael Welz of Lockheed Martin Space Systems Company for helpful discussions about the Stirling system and the VCHP. Tim Wagner was the technician for the program. 3. Tarau, C., Anderson, W. G., Miller, W. O., and Ramirez, R., “Sodium VCHP with CarbonCarbon Radiator for Radioisotope Stirling Systems”, Space, Propulsion & Energy Sciences International Forum, Johns Hopkins Applied Physics Laboratory, MD, February 23-25, 2010. 4. C. Tarau, W. G. Anderson, and K. Walker, “Sodium Variable Conductance Heat Pipe for Radioisotope Stirling Systems,” 7th International Energy Conversion Engineering Conference, Denver, CO, Aug. 2-5, 2009.